The number of search results in Google changes dramatically over time. Overnight the results can change from about 700.000 to more than 14.000.000. That’s a 2.000% change! So what’s happening here? And how does this affect your SEO strategy? We’ve been monitoring Google search results closely with daily screenshots. Here are our findings so far. We use Stillio to monitor Google search results pages for top keyword phrases. We track “Auto insurance price quotes” because it’s an expensive AdWords phrase and we monitor “San Fransisco health clubs” as an example for local business searches. All screenshots for "auto insurance price quotes" and “San Fransisco health clubs” can be found on the Stillio website. The study started July 18, 2014 and is ongoing. During the research the number of search results for “auto insurance price quotes” fluctuated between about 700.000 and 14.400.000 results. These are approximate numbers, but the difference is staggering. Most noticeable is the decrease in search results in October and November and the dip around November 11. Google is very important for local businesses too. 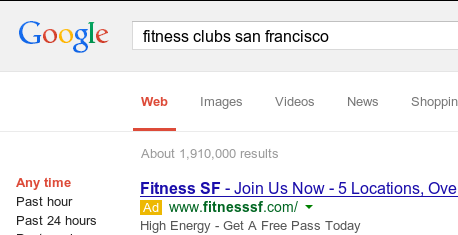 That’s why we included “San Fransisco health clubs” in the study. The number of search results for this keyword phrase also changes a lot, ranging from about 1.910.000 to 16.600.000 results. More than a factor 8 in difference. Again we noticed a huge difference in number of search results. Most noticeable is the steady trend since december 2014. We see no similarity comparing these search phrases. 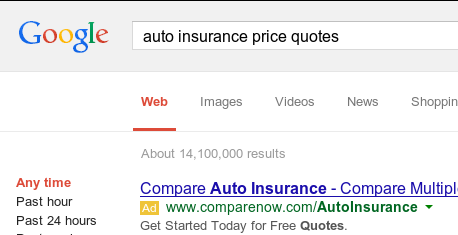 The only surprising thing is the fluctuation for both keyword phrases. But it’s not occurring at the same time. It seems to happen quite randomly. What's the difference in search results? The top two results are the same on both days. 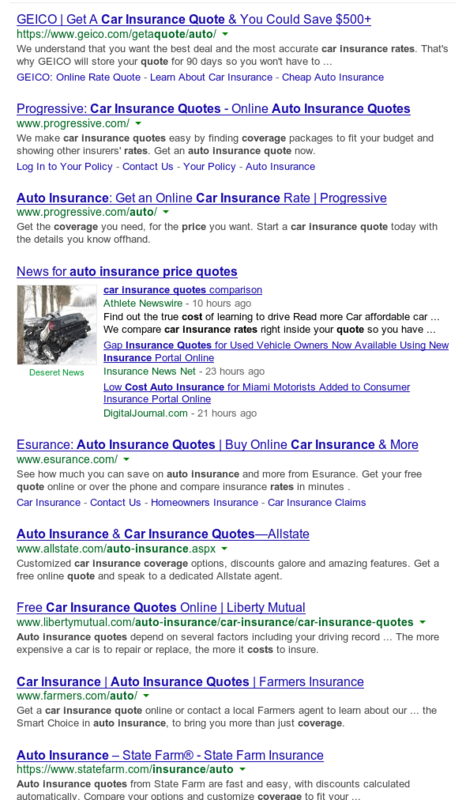 On October 19 a second www.progressive.com result was displayed and news results for “auto insurance quotes” were introduced. 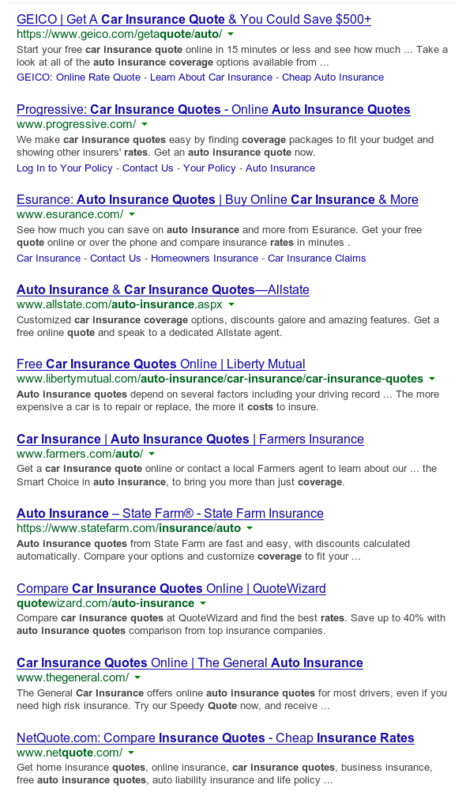 Also www.statefarm.com was displayed with two results instead of one the previous day. Overall 7 out of 10 results were the same. This shows how Google experiments with filtering results by the same domain. But overall the top results are pretty much the same on these two days. What's the trend in search engine results changes? When looking at these graphs it’s difficult to spot a trend. But when we remove outliers it’s possible to calculate an overall trend. In general the number of search results decreases over time. Which is notable since the web is still expanding. The most obvious explanation is Google changes it’s algorithm quite drastically over time. The truth is we don’t know what causes these changes. A factor might be the display of less results of the same domain. Another factor might be Google’s ranking algorithm improvements. A better algorithm delivers more relevant results. This explains the decrease in search results. Google explains these differences in their search protocol reference, but this hardly explains the changes we noticed. Please share your ideas on these differences in the comments. How does this affect your SEO strategy? Be careful to take the number of search results too seriously since they change dramatically over time. Especially when you research competition for keyword phrases you’d like to use in paid SEO campaigns. Keeping an eye on the downward trend in search results is also important to spot changes in Google’s ranking algorithm. Our study is ongoing and in the future we will report more results for other search phrases as well. In the mean time we like to hear your thoughts in the comments.